NEW YORK (CNNMoney) -- Google just took your phone a step closer to replacing your wallet in the mobile payment revolution. The company expanded its mobile payments platform, Google Wallet, to accept multiple credit cards. Users can now connect their Visa (V, Fortune 500), MasterCard (MA, Fortune 500), American Express (AXP, Fortune 500), or Discover (DFS, Fortune 500) cards with the new version of Google Wallet. It's an update from the company's previous partnership with MasterCard, Citigroup and Sprint. Instead of swiping a card, users enter their card info into the service and are able to tap their phones at venues accepting Google Wallet payments. It's a step forward for the company looking to delve into the mobile payment realm - an increasingly crowded space. The latest update also provides a cloud-based version of the app -- a move Google (GOOG, Fortune 500) hopes will provide more security for users. 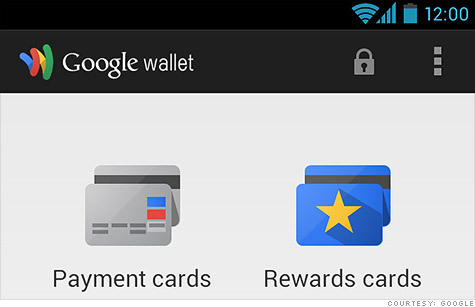 The feature allows users to remotely disable Google Wallet if a phone is lost or stolen. Google Wallet only works on near-field communication (NFC) -enabled devices, and is limited to Sprint (S, Fortune 500), Virgin Mobile devices and the Nexus 7 tablet. There are now twenty-five national retailers -- from Macy's (M, Fortune 500) to Duane Reade -- accepting Google's mobile payment app and according to Google's post about the update, 200,000 locations where people can use Google Wallet. While it's a step forward, Google admits it still has a long way to go. Most people haven't ditched their wallets for smartphones and several phones on the market don't have NFC capability, which is integral for Google Wallet. "Changing behavior is very difficult," Robin Dua, who heads product management for Google Wallet, told CNNMoney. "This evolution will require retailers and issuers to make changes, and it's going to take some time." But Dua says the process has started. The product manager pointed out that smartphones manufactured with NFC chips are becoming standard.